Its been so dark and wet here today that I've been tempted to dig some of our winter woollies out of storage! 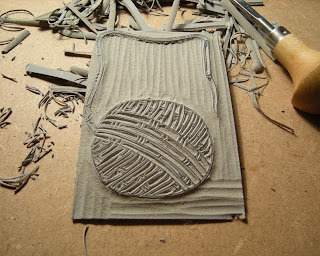 Whilst we wait for the weather to improve I've been cutting some lino blocks for a new business card commission. 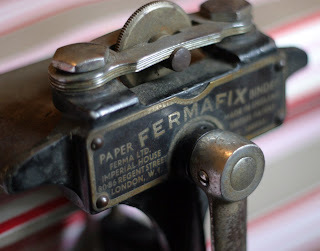 This little gadget is screwed onto the corner of a bookshelf in our study - the Fermafix Paper Binder! 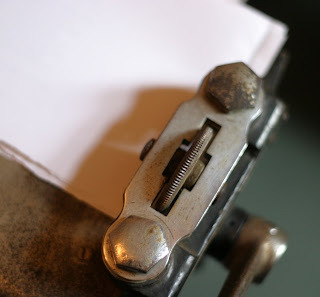 Sheets of paper are fed between two notched wheels, turned by a long handle, which crimp the sheets together. The interlocking notches on the wheels work a bit like a zip to hold the pages together. Very useful for binding my endless lists together. The patent number was registered in 1933, but as yet we haven't been able to find much out about it. 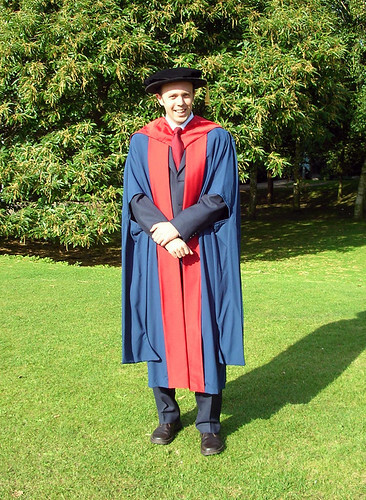 Yesterday was Jon's graduation at UEA - here he is looking dandy in his robes and bonnet (designed by Cecil Beaton, no less). Next week we'll be starting on some new prints - hooray! Many apologies for almost a month long blog absence! Where do the weeks go? Life at SpoonerGregory Acres has been extremely busy for the past few weeks, but hopefully we can start to relax again now and post more regularly! Since we last posted we've acquired a big, cool new block to add to the collection (thanks again Alan!). 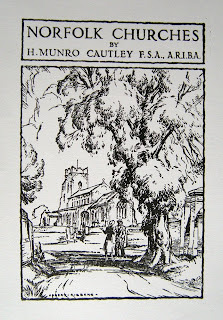 This one is for the cover of a book (well known in these parts) - Norfolk Churches by Munro Cautley, originally published in 1949 with a watercolour by Albert Ribbans on the front cover. Cautley was also an architect, and there's a Flickr group devoted to his work. The tree in Ribban's watercolour has gone, but here's the church from almost the same place. 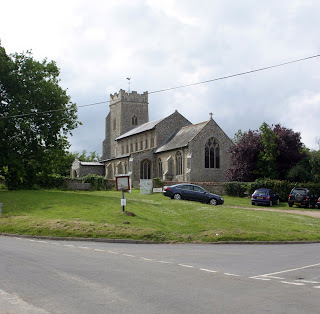 You can find out more about the church on Simon Knott's Norfolk Churches website, always our first port of call for Norfolk church related things. Now we just have to get our hands on a copy of the book! I have finally finished sewing together the pile of little notebooks that I started a while ago. 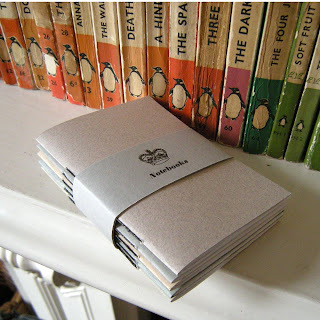 Sets of five notebooks are listed in our Folksy shop at the moment. Our Folksy shop was in serious need of restocking, and this afternoon is the first chance I've had to sit down with a cup of tea and do it, although there's still more to list. 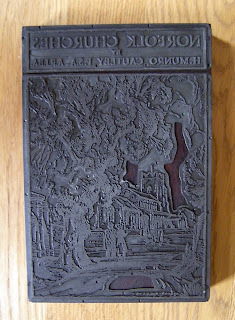 Jon is busy working on a new engraving, which should be finished by the weekend. 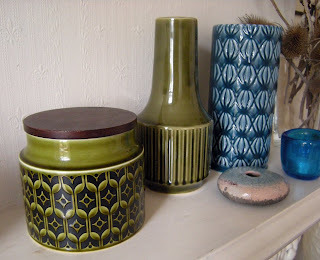 And finally - on my way to the Post Office with some orders this morning I couldn't help but notice this dandy Hornsea storage jar in the local charity shop, so naturally it came home with me and is adjusting to life on our mantlepiece rather than at the back of a dusty shelf.